The award-winning graphic novel Artesia comes to life in the Adventures in the Known World RPG, using a modified and easy-to-use Fuzion-based roleplaying system to plunge players into the strife-riven realms of the Known World, from the warring Citadels of the Daradjan Highlands to the never-ending feud between the Sun Court of Illia and the Phoenix Court of the Empire of Thessid-Gola. Artesia: Adventures in The Known World is a 352-page, full-color book containing all the rules and background material needed to begin play. The book is profusely illustrated by images from the comic book series and by images and maps specially prepared by the author for the game. 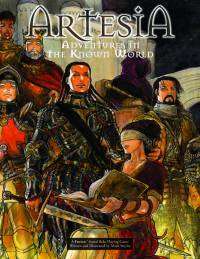 Save big on the Artesia RPG and Graphic Novels at DriveThruComics.com! This sale runs for one week only, so act now!